Bernies is renowned for the best service around. Let our friendly team help make your musical life a little easier. Phone us directly on 9872 5122 today. Vincent Tarin was born in Blois, France. With a close friend as a piano technician, he developed a fond interest in pianos. After school, Vincent studied a four-year apprenticeship at the Institute of Technology for European Music Trades (ITEMM) in Le Mans, France. He was employed as a piano technician for five years in Ireland and, during this time, visited and toured piano factories extensively throughout Europe. 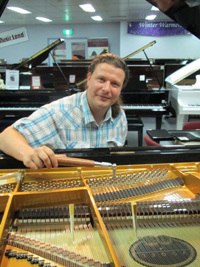 In 2011 / 12 Vincent studied and worked in the Schimmel piano factory in Braunschweig, Germany. He has been awarded the prestigious title of "Schimmel Concert Technician" reflecting a deep knowledge of Schimmel instruments and technology. Vincent migrated to Australia in September 2012 and Musico / Bernies Music Land is proud to offer his specialty services. Home service includes a written report on the condition of your piano, along with expert advice for the care and maintenance of the playability of your piano. Book here or phone 9872 5122. Including pitch raise, regulation, voicing and hammer work, adjustments, minor repairs and regular maintenance. Available on same visit as tuning. Charged per 15 minutes. Does your concert or event need a quality piano organ? Bernies Music Land offers an exclusive range of premium instruments for event hire anywhere in Melbourne and surrounding suburbs. This includes Schimmel pianos, Bernstein Pianos, Hammond Organs and Johannus Organs. Please browse our gallery and phone us on 9872 5122 to discuss your needs and we can provide a quotation. Bernies is delighted to have Lindsay Stodden as part of our team. Lindsay is our Service Manager, looking after all electronic instrument and amplifier servicing. Whatever the problem, Lindsay probably knows how to fix it. He is in the store three days a week looking after our customers and always seems to be carrying around an interesting case on a trolley. Lindsay owned his own recording studio and is a sound engineer, so he knows when something sounds good. Personal interest led him to electronics, and among other qualifications, he is an amature radio technician and a video specialist, having designed sound and video setups for large theatres. Lindsay plays piano and organ, mainly theatre style, and listens to classical music. His quick wit is a welcome addition to our Bernies crew and we are sure he will be of good assistance to our valued customers. Please phone (03) 9872 5122 to chat with Lindsay about your service needs. Workshops, Masterclasses, Educational Events and private sessions are available to our customers to help educate, support and inspire your musical enjoyment! You can even have a hands-on workshop at your home! Education services: Bernies Music School is a service to our customers. When you select a new piano or organ at Bernies Music Land, you are eligible for VIP rates with our wonderful education programs. Our exclusive "2 Years Upgrade Option" comes with any purchase. This means that in two years time if you are ready to step up to the next level of instrument, your trade in will have the full value of the original purchase amount, so you can put this towards the new instrument. Conditions apply, please phone us on (03) 9872 5122 to find out more. Piano tuning service - phone or email us and we can arrange your next piano service at a convenient time for you. Complimentary capuccinos when you visit! On-site consultation service, to ensure that we recommend the best instrument to suit your needs. We will follow with a prompt quotation and are pleased to offer exclusive school special prices. Payment flexibility, including payment terms and leasing plans. Our exclusive “Buy A Key” fundraising plan to help your community achieve the desired instrument. Special Hire rates for premium quality pianos, organs and keyboards for your performance use. Tuning service; with our network of state-wide piano technicians, we can promptly arrange tuning service at your location. Specialist organ consultant, Mr. Craig Douglass is at your service. For small or large organs, it is important to get the right advice for your needs and acoustic environment. Bernies Music Land’s on-staff consultant is at your service Australia-wide, to find or create the perfect organ. Please phone Craig on (03) 9872 5122 or email craig@musicland.com.au to enquire about this extensive service. On-staff technician, to support the maintenance of your electronic organ or piano, Bernies Music Land is proud to have a highly experienced on-team technician. Our technician is also available for on-site service and phone support for our customers and can be contacted here at the store on (03) 9872 5122. Musicians workshops, available at your School or Church, to promote your organ or piano and assist musicians in better understanding and utilising the instrument. Educational events for music professionals, held at Bernies Music Land with an outstanding selection of guest speakers. These regular seminars provide professional development, encouragement and inspiration for your team. Complimentary quarterly newsletter, to keep you up to date with the musical instrument industry, including new technology, new instruments, activities and special events. To enquire about any of these services, please phone our friendly team on (03) 9872 5122 or email us.